Produced in Los Angeles between 1959 and 1991, the magazine featured rollicking stories about hot-rods, drag-racing, muscle cars, makes and models from Chevys and Mustangs to Corvettes, and even imaginary and fantastic vehicles. 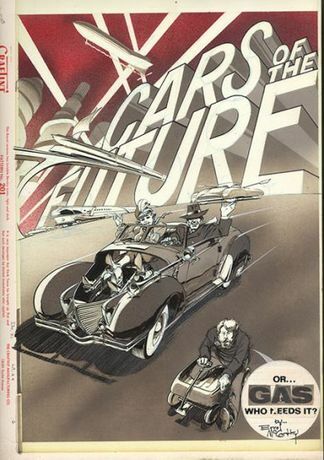 CARtoons is a spirited documentation of American car culture over three decades. This exhibition presents original art by several regular CARtoons contributors: Steve Austin, Fred Boatman, Joe Borer, Dave Deal, Nelson Dewey, Mike Dormer, Dennis Ellefson, Tom Foxmarnick, Bob Hardin, Hank Hinton, Shawn Kerri, Darrell Mayabb, Errol McCarthy, Pete Millar, Alex Niño, William Stout, George Trosley, and Monte Wolverton. Using hand lettering, dry transfer typefaces, screentone, photography, and above all a lively line, these masters of automotive cartooning brought to life an array of recurring characters, inside jokes, and crazy cars.